Mallards House was once the home and shop of a master watch and clock maker and jeweller, Horatio Prickett. Horatio had established his business at his home in Church Road in 1870. After a few years he became tired of the premises at Church Road and in 1877 decided to build himself a new shop and house at The Plain. The house was built by William Apps, the village bricklayer, at a cost of £1000 and was first named Comera House but later to become Plain House. In 1881 Horatio contracted pneumonia “which brought on galloping consumption” and he died on 2 July at only 33 years of age. After his death his brother took over the business for a short while and then the house was sold to Mr Hussey of Scotney Castle. By 1891 Edward Davis was living in Church Road with his family and is a saddler and harness maker. The 1901 census shows he had moved to The Plain House and is carrying on his business with assistance from his son James. He is also listed in the trade directories between 1891 and 1903. In 1913 his trade listing is expanded to read ‘Edward Davis & Sons, saddlers & harness makers, jobmasters, general carriers, coal merchants, furniture removers, motor car proprietors & agents for the S.E. & C. Railway and Sutton & Co.’ . In 1914 the advert is back to simpler terms but ‘E Davis and Sons, fly proprietors, etc.’ is added as a second listing. The last trade entry is in 1916 when only the ‘saddler and harness makers’ listing appears. Having lived in Goudhurst for 32 years Mr Davis died in 1920. His wife died just under a year later. They are both buried at Frinsted. An article in the Goudhurst Jubilee Book 1935 tells us that during WW1 Edward Jarvis came to Goudhurst with his family when the house adjoining his in London was blown up. He worked as a saddler and harness maker at Plain House. He advertised his business in the Kelly’s trade directory of 1922 and, in 1928, he advertised in the parish magazine. There is no indication how long he stayed at Plain House but, by 1932, a motor garage had been established there. In March 1932 Mr C F Trevor was proprietor of Chequers Garage and he regularly advertised his business in the parish magazine. The street directory for 1935 shows that Jesse Apps was living at Plain House with his wife and that he was a motor engineer. Between 1938 and 1940 his listing had changed to show the business as ‘Apps Motors’. The trade directory of 1948 shows that Mr Chas. Eric Boorman was a motor engineer at Chequers Garage. By the 1960s the garage had changed hands again and was then known as Hoad’s Garage. Another entry in the parish magazine in 1975 mentions Mr Baldock of Chequers Garage. Mr Baldock is said to have been an ‘avid collector of vintage machines’ and the article tells us that he had recently purchased a bicycle bearing the name of William Rootes of Rootes Group fame. The garage business finally closed and, until the end of 2017, the premises were the offices of an estate agency. The name was also changed to Mallards House. In January 2018 the property became offices of a wealth management company. 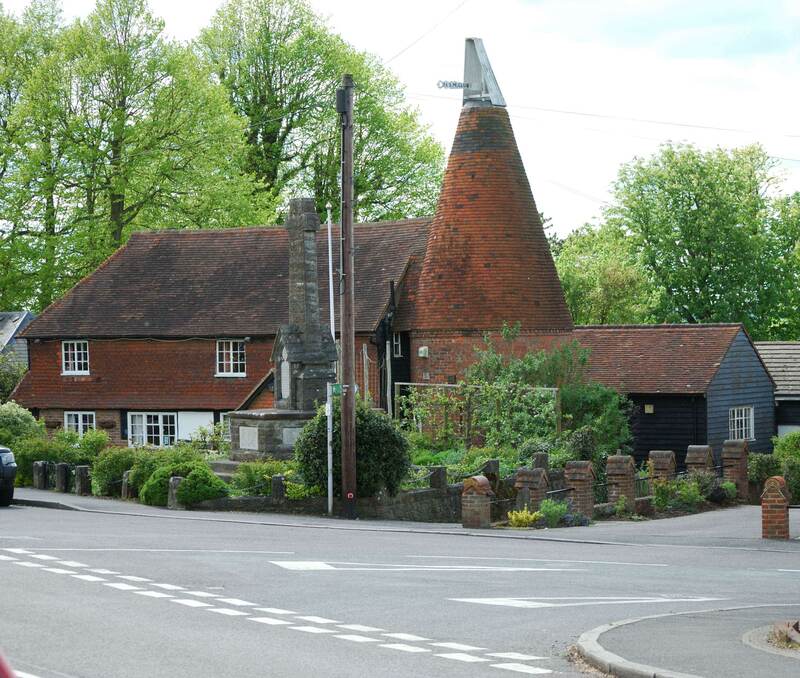 In the early 1800s the oast house, barn and surrounding land was owned by Stephen Groombridge and leased to Samuel Beeching, a farmer and baker who lived in the High Street. 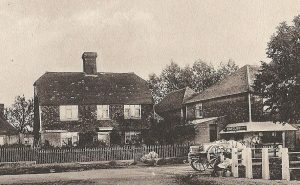 Samuel died in 1902 and Sir Charles Jessel, of Ladham House, subsequently purchased the land where the oast house stood. 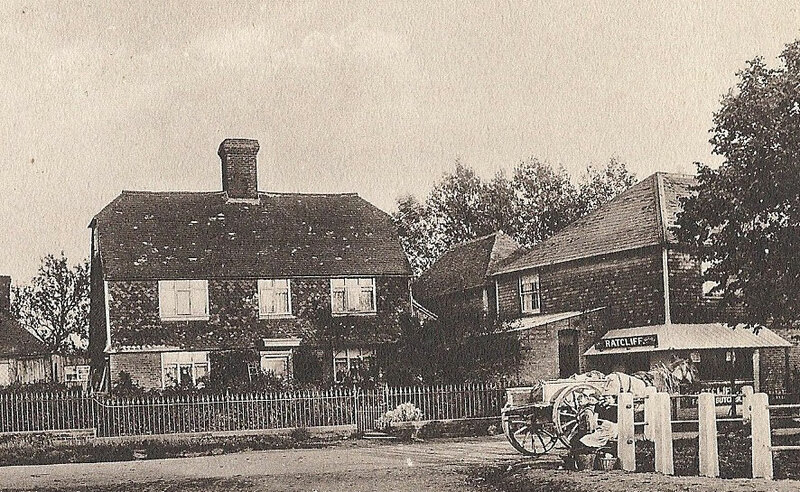 The Goudhurst Club for ‘Comrades of The Great War’ was formed in 191 and their first members’ meeting was held in 1920 in premises hired from Mr H J Benians in Back Lane. By 1924 new premises were needed and Sir Charles Jessel let the oast and barn to the club. The name of the club was changed to The Goudhurst Ex-Servicemen’s Club. Sir George died in 1928 but his son, Sir George Jessel, Bart., MC., maintained a connection with the club as its President. 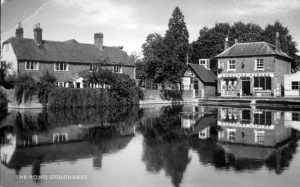 In March 1929 Goudhurst Royal British Legion was formed and their monthly meetings were held in the Ex-Servicemen’s Club. On 23 June 1938 His Royal Highness the Duke of Kent came to Goudhurst as part of his tour of Kent. During his visit he went into the Ex-Servicemen’s Club and signed their visitors’ book. He also went upstairs to meet the mothers and children of Infant Welfare Group, who regularly met there. When he left the Club he went to the Village Hall and saw an exhibition prepared by the Goudhurst Local History Society. In 1951 the Goudhurst ‘Old People’s Club” was formed and their early meetings were held at the Ex-Servicemen’s’ Club. On 2 June1953 a television was set up in the upstairs room at the club and many villagers gathered there to watch the televised broadcast of the Coronation of Queen Elizabeth 11. Today the Club is still open and hosts many social events. In the 1840s John Paine lived in the property that is now The Pharmacy in the High Street. He was a hairdresser and barber, not a chemist, and he ran his business in one part of the shop while letting another part to a bootmaker. In the 1870s John laid claim to a small piece of land at the Plain, where the war memorial now stands, and started to build a house there to live in when he retired. The size of the plot only allowed for a very small house with one room downstairs, a bedroom upstairs reached by a ladder, and a cellar. Sadly, John died in 1879 before he retired. The name is said to have come about when a villager took a length of wood, painted ‘Paines Folly” on it and pinned it to the house, presumably in fun. The name stuck. After his death John’s former housekeeper, Ann Pooley and her niece, Mary Ann, lived at the Folly for a short while before moving to live with Mary Ann’s parents in Ashford. By 1881 Caroline Rhubridge was living at the Folly, Caroline was the village nurse and midwife as well as a shopkeeper selling sweets. She is said to have been a large lady weighing some eighteen stone, not ideal in such a small house. However, she stayed there until she died in 1913. Mrs Rhubridge’s sister lived there for a short while after her death. In 1923 Sir Charles Jessel purchased Paines Folly. The house was demolished and the land given to the parish as a site for village the War Memorial. The memorial was built on the site and unveiled in 1924. The Westminster Bank transferred its business from Bank House, West Road to the newly constructed building at the Plain in 1934. 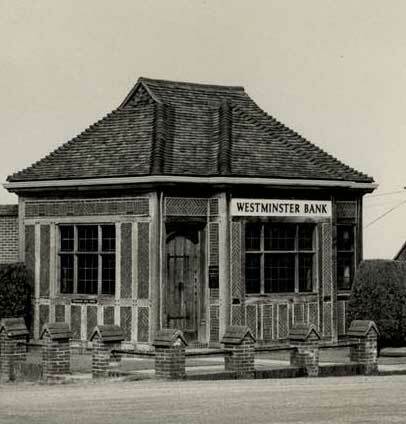 At a time when cash was the main currency the bank flourished. However, by 1996 how we handled our money had changed considerably and, despite mergers with other Banks, branches such as this were in decline. The National Westminster branch at Goudhurst finally closed its doors on 2 February 1996. The building has been extended and renovated in recent years and is now offices. The 1842 tithe apportionment schedule lists the owner of a ‘cottage and garden’ on this site as the Dean and Chapter of Rochester and Samuel Hobbs is in occupation. The 1841 census confirms this and shows him as a blacksmith as was his father, Peter Hobbs. By 1848 James Bearsby had moved to the forge from Stonecrouch, where he had worked as a blacksmith with his father. He stayed at the forge until he died in 1891. In about 1889 the Ecclesiastical Commissioners had sold the property to David Southon, a local farmer and butcher. It was Mr Southon who had the wall and iron rails put up round the front garden. The rails are now grade II listed. By 1901 (Stephen) Thomas Crouch had moved to the forge with his wife and family. Following the death of David Southon in 1895 and then his youngest son, John, in 1904, the forge and house were sold to Sir Charles Jessel for Mr Crouch so that he could stay on there. The purchase was subject to the condition that the forge was to remain unaltered. In 1908 Thomas Crouch took a seven year lease on the wheelwright’s workshop premises at Rose Villa in North Road and thus expanded his business to blacksmith, shoe smith and wheelwright. In 1931 he died at the Forge House. His wife, Mary, carried on living there until 1937 when she too died. With the coming of motorcars the need for blacksmiths and wheelwrights declined. The house and smithy have since been become two separate dwellings, The Forge House and The Old Smithy cottage. The original house is believed to date from the 17th century but could be earlier. It stands on land that once belonged to the Church. In around 1850 Richard Springett (of Finchcocks) had a house and shop built for David Southon. David Southon set up a butchers business with his father, who had previously traded from Gazebo in the High Street, and his brother, Thomas. David also became a successful farmer and stock dealer using Bell Farm, Hammonds Farm and Four Wents Farm in the parish. When David died in 1895 his youngest son, John, carried the business on for a short time until 1901 when he moved to Halling with his wife, Florence. The house and business premises were leased to Edward Ratcliff for a term of 21 years from 25 March 1901 and the name ‘Ratcliff’s’ was displayed on the front. John Southon died in Halling in 1904. When probate was eventually granted on his estate in 1907, the house and business was sold to Ernest Wickham. Mr Ratcliff stayed on at the property but was compelled to close down and retire when his sons and staff went off to war. The Burfield brothers, John and William, were running a successful butcher’s business in the High Street when war broke out. William returned home safely when the war ended, having been awarded the Military Cross ‘for engagement with tanks in warfare’, and he and his brother John purchased the premises at the Plain. Together they set up a new butcher’s business there enlarging the premises and bringing it up-to-date. William ran the butchers business while John opened a fish and poultry business at his home in the High Street. William Burfield died in 1956 and the business closed. The shop premises has since become offices and the outbuildings at the rear have been converted to residential properties. 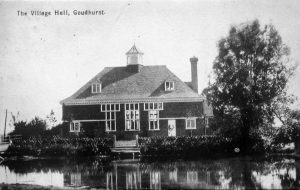 There had long been a need for a parish hall in Goudhurst and, on 1 February 1902 a public meeting was called to promote interest in a new building. The meeting was held in the National School and was well attended. Sir Charles Jessel chaired the meeting and stated that he and other members of the community had already started to look for possible sites. He reported that, as yet, no suitable site had been secured but he was hopeful that negotiations with Mr Smart might be favourable for a site adjacent to the Plain. Sir Charles said that the estimated cost was £1100 and he announced that funds, collected and promised so far, had reached £1000. Mr Lucas had drawn plans of the hall, and Mr Barry, of The Parsonage, had brought along a scale model of the proposed building. A Committee was set up with Edward Hussey Esq., Sir Charles Jessel, Bart., and General A Fitzhugh appointed as Trustees. On September 6 a further meeting was held at the Vine Hotel at which Sir Charles Jessel advised that still no suitable site had been found. However, General A Fitzhugh had offered about a quarter of an acre of Wall Field Garden as a site for the hall to be purchased at a nominal sum. The offer was accepted. By this time funds had increased to £1076. Local firm, David and Leaney, were contracted to build the new hall in 1903 at a greatly increased cost of £3000. In 1907 a large flat roofed bay extension was added on the south side, which brought more light into the hall. In 1952 a further extension was added to the southwest corner to provide a kitchen. Sarah Giles, a resident of the village, then aged 102 years, declared the new kitchen open. In 1954 the hall became a registered charity. In 1967 a suspended ceiling was installed in the hall. Following their use of the hall as a canteen during the making of the film Grand Prix, Metro Goldwyn Mayer met half the cost. Some opening scenes of the film were shot at The Star & Eagle in the High Street. In June 1989 the hall was declared a Grade II Listed Building. In 1966 the Committee purchased the BT behind the hall, formerly a telephone exchange building for £26,000. It is currently used as a storage room. A contract for the refurbishment of the hall was awarded to builders, Cornfords of Brenchley, in 1996. In January 1997 work began to create a new meeting room and a storage room on the first floor, new ground floor and first floor toilets, an improved kitchen and a new stage area. The refurbished hall was officially reopened on 26 September 1998. The new meeting room was named ‘The Jessel Room’ commemorating the Jessel family’s connection with the hall and the village. Today the parish hall is still used as a venue for village clubs and societies as well as for wedding receptions and parties. In the early 1800s the village pond was known as ‘Wall Pond’ and was owned, together with surrounding fields, orchards and property, by the Church. 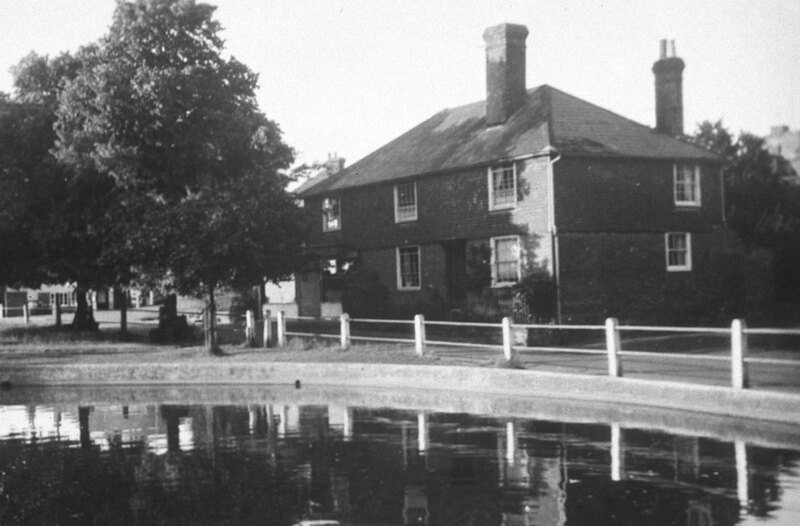 The pond was enclosed when the new Parish Hall was built in 1903. In around 1910, George Hinds had collected two swans, a cob and a pen, to swim on the pond. In April 1913 the cob was killed in a fight with a dog. The dog had swum too near to the swans’ nest and the male, with help from the female, was attempting to drive it away. Sadly the male was bitten by the dog and died of his wounds. A few months later, in July, a new male was obtained but the female did not take to him immediately and was frequently seen chasing him out of the pond. In 1936 the female swan was found dead on her nest behind the war memorial. She had been well known in the village where she would calmly walk across the road and hold up the passing traffic. The male was seen to be moping and so, in July, a new female was brought in to keep him company. In 1964 a parish meeting became quite heated when attendees were asked to decide whether there should be swans or ducks on the pond. Some thought that ducks would be better because swans strayed from the pond and caused traffic problems. Others wanted to keep the swans because they attracted visitors to the village. The votes were cast. The result: 19 for ducks and 6 for swans. The ducks had won! In 1980 two new swans were brought to the pond but now there are just ducks. Goudhurst has always celebrated royal events in a grand way. In celebration of Queen Elizabeth’s Coronation in 1953 a model of the Houses of Parliament was floated on the pond. In June 2012 a replica model, complete with lighting, was floated on the pond and small boats were sailed across it in celebration of the Queen’s Diamond Jubilee. Seats have been put in around the big tree and around the pond creating a favourite place for tourists and residents alike to relax or maybe to have a bite of lunch and feed the ducks with their scraps.